Which aspects of a controversy is a semi-automated analysis able to return? Is it possible to depict the different cultural points of view on a controversial topic analysing Wikipedia? Can the results be used to improve awareness on the existing differences among cultural approaches on the controversy? These are the principal questions that I’ve put as starting point of my research project and to whom I hope to be able to provide an answer to with the publication of obtained results. CHOICE OF A CONTROVERSIAL TOPIC – As first step, I chose a subject characterized by different connotations according to specific cultural backgrounds of communities: homosexuality seems to be a critical theme for many culture and each nation has an own level of tolerance of it. The meeting between a separate management of the phenomenon and the self- maintenance and conduction of Wikipedia’s editions is a favourable occasion to observe not the emergence of different points of views but the simultaneous existence of several neutral definition of homosexuality. 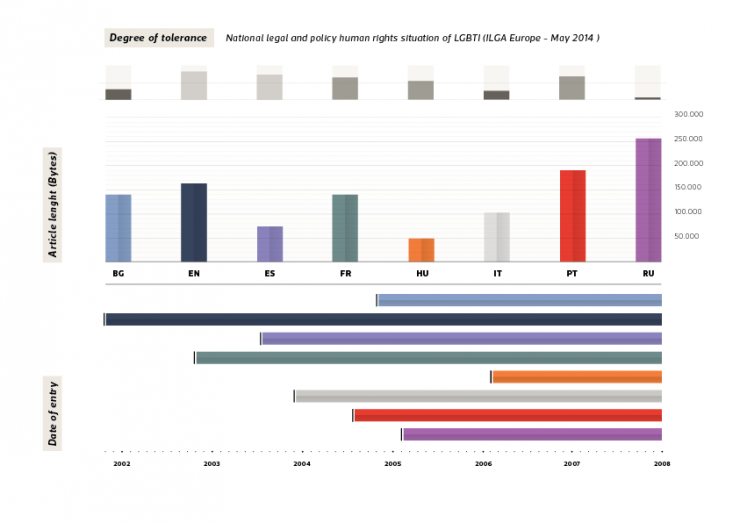 RELEVANCE CHECK – The second step is an examination of the effective consideration of the theme verifying how many editions have a dedicated article about that and subsequently the selection of eight European communities which have a different statement versus homosexuality: (reports of Ilga-Europe association on human rights situation of LGBTI people in Europe). 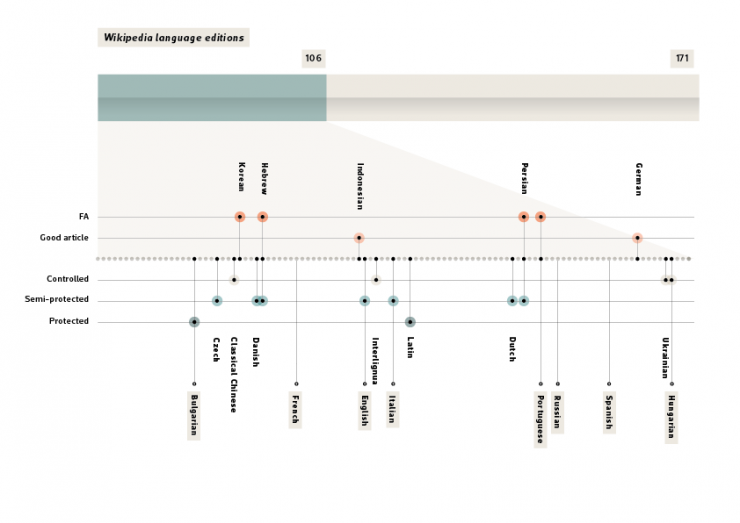 DATA COLLECTION – The correspondent pages in each linguistic edition are been investigated reporting data from various features not directly connected with content. The data collected with quantitative, semantic and qualitative analyses has permitted to make a cross-cultural comparison on several aspects of debate (as user, edits and macro-areas of discussion) and returned some information about communities approach to homosexual phenomenon. The comparison is structured in five point of interest: development of discussion in time, behaviour and characteristic of user, elements of discussion, cultural interest on topic, self or global focus. How important is the phenomenon and which level of familiarity/tolerance different cultures have with it? Presence and status of the article (Protected, semi-protected, controlled, good article, FA/featured article) are the first indicators of a discrepancy on the activity generated from the theme. Homosexuality is present in 106 language editions out of 277; in few edition the page is protected, semi-protected or controlled. Only in four language the topic has been awarded as “featured article” on the main page. Same topic means same information? Comparison of basic information of pages: entry date and quantity of information contained of each edition selected. Is there any connection between length of description and degree of acceptance of homosexuality in cultures? As degree of tolerance I used data coming from the reports of Ilga-Europe association on human rights situation of LGBTI people in Europe. While there is not a clear relationship, the Russian edition stands out for the size of the page compared to the degree of tolerance. How much time after the entry of the article is the discussion started? How many editors participate also in talk pages? The birth of a talk page is linked to the needs of users to find an agreement on the correctness of the content to share. The reduction of the gap between the article’s insertion date and the birth of its talk page can be viewed as an indicator of a different need to debate? This interlude decreases with time: the talk page of the English article was introduced a year and a half later, while in other editions it took less than twelve months. The reduction of margin was due probably to an increase of the noise generated by homosexuality whose criticality in 2001 was not the same of 2004: the number of laws worldwide relating to homosexual persons is increasing. The percentage of editors who participate in talk page also shows a divergence in the involvement degree in controversy. In the Russian page, which is connected to the nation who have the lower tolerance toward homosexuality, the need of user to bring the debate to a second level seems to be stronger than in the others. Has the discussion a regular pattern or shows irregular peaks? Periods of high dispute coincide with high involvement? A coincidence of trends suggests an intersection of interests between communities and therefore an increase of the discussion linked with events of cross-cultural relevance. 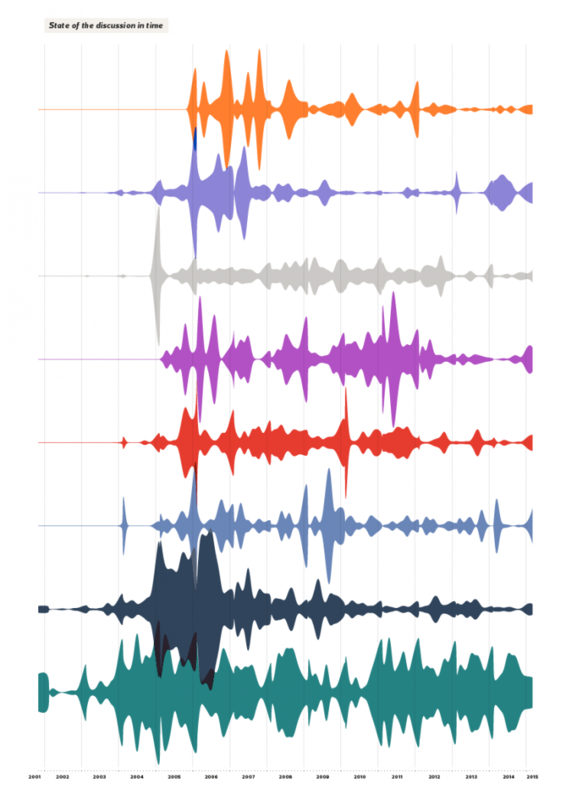 However, the analysis of edits for month made on homosexuality pages brings to light a debate that is clearly far to be connected between editions. Each edition follows its own line of debate whose peaks could be linked with particular local events or issues that are not relevant for the other cultures. The causes of a conflict in a page just few times exceed local barriers coming to be cross-cultural disputes. Which period has gained more participation? Many edits coincides with a high involvement? A significant gap between number of edit and number of participating editors is signal of a heated dispute, identifiable with an edit war. An equality of the two quantities indicates a co-productive behavior of users, which participate without discussing; on the other hand, an ample variance symbolizes a long negotiation debate inside the community and highlights the difficulty of users in finding a common neutral view on homosexuality definition. 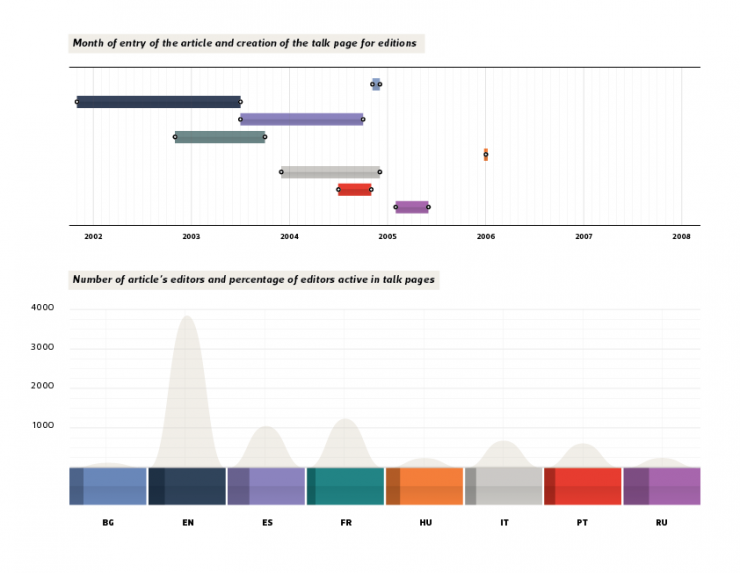 In English and French pages the number of editors involved is similar to edits sum which means that there is an equal participation of users in highest discussion periods. In the other cases, a more critical perception of the theme causes a more drastic diatriba. Which linguistic edition of the article generates more debate? The presence of many discordant views on content’s neutrality causes an increase of edits therefore a higher average of edits for user. The data analysis allows to identify the pages with a more frequent tendency to the debate: the editors of Russian and Hungarian pages seems to be less prone to compliance when it is for the definition homosexuality. These first analyses on relevance and chronological development of controversy associated with homosexuality shows that there isn’t an evident overlapping of discussion between editions. 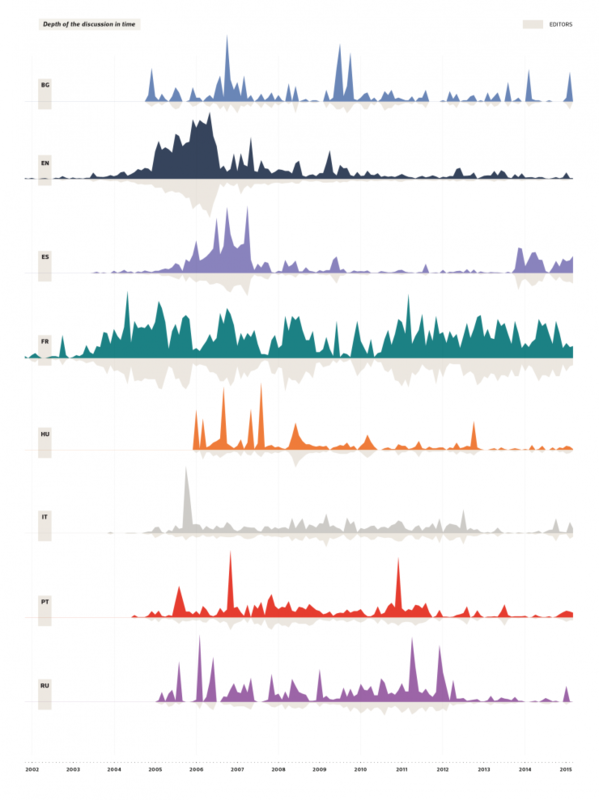 The different cultural perception of homosexuality influences the participation of users in debate and, as a consequences, produces disconnected periods of discussion between editions: each timeline seems to reflect its own community diatribes on topic and not an involvement in a common discussion with others.